ORLANDO, FL – Oct. 31, 2018 – Florida Cup officials today announced the media accreditation window is now open for accredited members of the media to cover the Sunshine State’s largest annual celebration of international football and entertainment. Accreditation applications will be accepted only through Dec. 10, 2018. On Tuesday, Jan. 8, event officials will be joined by team representatives and local community officials for the formal kickoff press conference to mark the start of the 2019 Florida Cup. On Thursday, Jan. 10, Orlando City Stadium will host current UEFA Champions League contender Ajax Amsterdam (The Netherlands) against Flamengo (Brazil) at 7 p.m. ET, while scenic Al Lang Stadium in St. Petersburg will host the Bundesliga’s Eintracht Frankfurt (Germany) against Sao Paulo FC (Brazil) also at 7 p.m.
On Friday, Jan. 11, Florida Cup will offer accreditation for working media to the Florida Cup Fan Fest at Universal Orlando Resort to cover the concert by Brazilian superstar Ivete Sangalo. On Saturday, Jan. 12, Orlando City Stadium will host the finals in a spectacular double header: Sao Paulo against Ajax at 1 p.m. ET, and Flamengo against Eintracht Frankfurt at 4 p.m. ET. The day will also feature a performance by international superstar Ivete Sangalo and special guest at 3:30 p.m. ET, after the first match. CLICK HERE TO APPLY or visit www.FloridaCup.com. Media credentials will be provided to accredited and legitimate media outlets only. The Florida Cup Communications team will review every request individually and will grant accreditation based on several factors including an outlet's readership / audience reach and prior coverage. 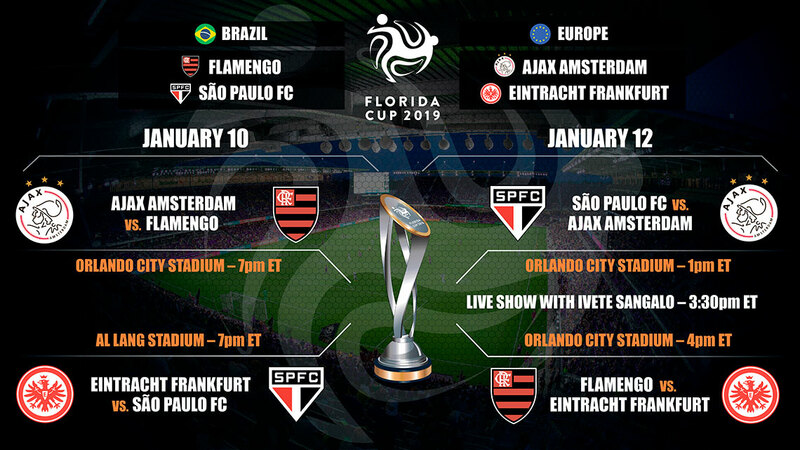 Visit www.floridacup.com to sign up for real-time updates, or follow us on Facebook, Twitter and Instagram. The Florida Cup is the largest international soccer celebration held annually in Florida. It is a global platform that combines sports and entertainment, with TV audience reaching more than 25 million in the past two editions. Globally recognized soccer clubs from Europe and Latin America will convene in Central Florida for this premier tournament – a final tune-up before the start of their respective campaigns. For more information on the Florida Cup, visit www.floridacup.com, or follow us on Facebook, Twitter and Instagram.